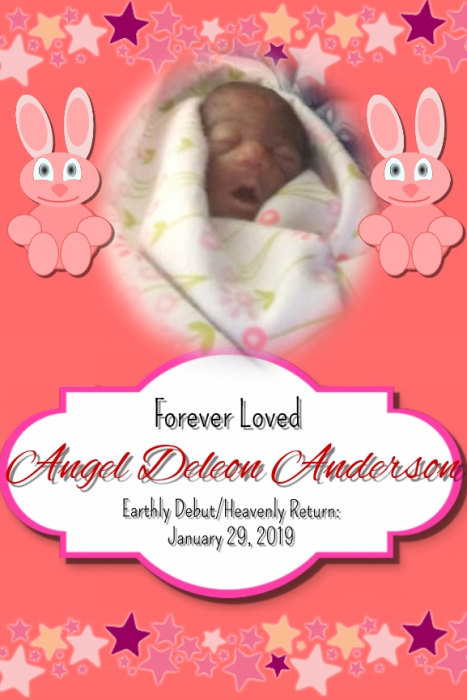 Angel Deleon Anderson (Infant) passed away January 29, 2019 in Bradenton, Florida. Though she was here but for a brief time, she was loved by everyone. Baby Angel will always be an Angel to us and is now in the arms of the Lord forever. She is survived by her parents: Deravin Anderson and Jawrutha Montgomery; aunts Jamesia Montgomery and Aciena Golden; uncle James Montgomery and a host of loving family and friends who will miss her. Graveside service will be with the parents saying their final goodbye at New Memphis Cemetery in Palmetto, Florida at 9am Saturday, February 9, 2019.